Kids love my rubber chicken collection! I like to make people laugh while teaching them about writing. I love speaking to children, teens, and adults. 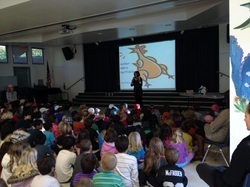 I have spoken at many schools, libraries, and conferences for students, teachers, and writers. I offer writing workshops and talks on a variety of subjects, and I'm happy to tailor a presentation to suit your group's needs. I have lots of public speaking experience and am the author of six novels for teens, two for pre-teens, and 24 humorous books for children. I wrote a humor column for the Orange County Register for nine years, two cover stories for Writer's Digest magazine, and dozens of other magazine articles. My fees are low and references are readily available. <-- That's me up there!